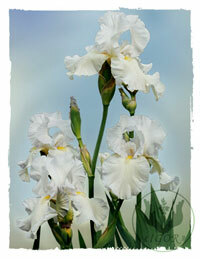 It has started in the spring of 1989 when I was presented with a SHIPSHAPE iris. This flower has not just attracted my attention but has given me another favourite occupation. A few years passed and I have finally quitted practicing medicine in order to start out the breeding of irises. In June of 1993 there were ...almost 20 (:-) of these marvelous iridescent flowers sparkling in the beds of mine. Some of them are still considered the gems of collection as they have stood the test of time and fashion. 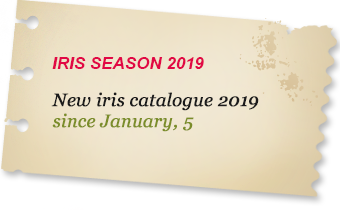 That is the way the iris collection has found its beginning. Every year the collection expanded and till the end of 1995 it numbered about a hundred of new cultivars. The following species have become its favourites: BABBLING BROOK, VANITY, SUPERSTITION and mysterious STEPPING OUT. I was eager to try my hands at breeding and to enrich my collection with my own cultivars (at that time I had a long time been involved in iris breeding). The first results turned out to be rather successful. In 1999 out of a few hundreds of seedlings I have selected 7 new cultivars, ILLUZIONIST, SPOGAD PRO DIANU, LISOVA PISNIA, NAZARIY YAREMCHUK, PISNI RUSALKY, MISIACHNE ZATEMNENNIA and VALPURGIYEVA NICH, which have entered the world of iris. Since then annually out of hundreds of species I choose 6-8 new cultivars representing the group of tall bearded (TB) irises. Moreover, every year a few dozens of new cultivars by world leading selectionists enrich my collection. All the cultivars are tested in the acclimatization-selection garden. I breed the best and catalogue them. Since 2000 beside TB irises, irises of other groups are cultivated. Next season we will present new irises of Miniature Dwarf Bearded (MDB), Standard Dwarf Bearded (SDB), and Border Bearded (BB) groups.